Is “vice president” Leni Robredo prepared to replace President Duterte? October 7, 2018 - by benign0 - 15 Comments. The Philippines’ poltical chatter continues to heat up with speculation around the health and ability to govern of President Rodrigo Duterte. As the tempo rises, so does scrutiny around the leadership chops of presumptive “vice president” Leni Robredo. The question in every Filipino’s head is a no-brainer. Is Leni Robredo fit to be Philippine President? “VP Robredo deserves the right to prove her qualifications and abilities to be president in her own style and approach on current problems of the country while you take a break and take that much-needed rest,” he said. “So, idol President, why can’t you give VP Robredo a chance to prove her qualifications? As a lawyer, you know she is entitled to due process or right to be heard before she could be accused of not being qualified to perform the functions of the presidency [to] which under the constitution she is the rightful successor,” he added. “Deserving” the “right” to prove herself? Really? There have been many reasons pitched by one politician or the other to the Filipino voter to earn their confidence. But asserting a “right” to prove one’s self is something new. Robredo’s role as supposed “vice president” is to be prepared. Is she prepared to replace President Rodrigo Duterte in the event he is rendered unfit to continue his job? It is important to be really clear about what we mean here by “replaced”. Duterte continues to enjoy the confidence of the Filipino people. In the context of this fact, Robredo needs to really understand what it means to be prepared to replace a president whose leadership style will likely linger as a reference upon which Robredo’s performance will be measured. 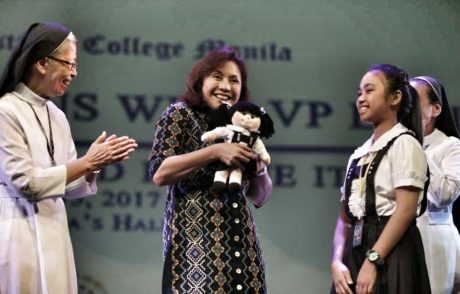 Unless Robredo has an equally-compelling alternative vision and pathway to guide her administration, being prepared to replace Duterte could have to mean having an appetite to continue his governance approach and remaining on point with his administration’s goals. But Robredo is a leader of the Opposition, which means she will likely be undoing everything Duterte implemented, steering the country onto a different path, and pandering to an entirely different set of stakeholders. Does the Opposition have a plan in place to undertake such a radical turnaround? Do they have a plan to get Congress, whose members remain supportive of the Duterte government, on board for the ride? This is where the importance of seeing past the disruptive and, often, destructive “dissent” of the Philippine Opposition led by the Liberal Party (a.k.a. the Yellowtards) and confronting the question What’s next? can now be appreciated. Success as defined by the Yellowtards has traditionally revolved around seizing power following a campaign to demonise a sitting incumbent. The aim of their campaign has, for so long, been to cut down and diminish their opponents to make them look less appealing to what they have on offer. In short rather than compete by coming up with something better, they tear down the enemy to make them look worse than their mediocre proposition. It is in this context of destructive politics that Filipinos should evaluate what Robredo — as possible replacement to Duterte — brings to the table. Is she offering Filipinos something better? Or will she be offering no more than the same mediocre Yellowtard narrative and then spend the rest of her days in office making Duterte’s legacy look worse in comparison? It’s time Filipinos ask their Opposition the right questions and the hard questions. She’s just propped up as the next Liberal Party figurehead, the last Aquino proved indecisive and more prone to political vendettas than proving he can be a good leader when the nation faces a crisis, he failed, utterly. Now we can see from the past and now to present, what does she offer other than a return to power for the same Liberal Leftist Yellow nonsense? this is just the same story with Cory, she laid the foundation of what can go wrong when a bunch of activist Human Rights lawyers under oligarchic support can do to a country, now Robredo is saying that she has the “right” to “prove” herself? this is a dumbing down process of Governance, she had plenty of chances when the last disasters struck the country, and where was she when hurricanes struck the Philippines? out in a photo op session or media tour or vacationing in the US. Or how about the Marawi Siege where she and her party were more concerned with politicking than dealing with terrorists that her predecessor ignored. Because much like every other loud mouth like her, when it comes to dealing with a crisis, she won’t life a finger other than looking pretty and taking credit where it’s not due. God forbid that any thing bad happen to President Duterte. If it so happens, The recovering Philippines will reverse it coarse, from ascending to descending. It will be a turbo-fast downfall of our country. Nothing will be left of it except the fake-democracy they have been reiterating for the longest time. She is not Prepared to be a Vice President for her Position is still under Protest because of Comolect Andres Bautista lenilutong lugaw of Smartmatic of mark malloch brown =political adviser and speech writer of Santa Corykot lantarang Pangugurakot at Pangagago sa Pilipinas for thirty five years of voting counting manipulations, it looks life forever suffering of late corykot wishes of Let the People Suffer so that they will hate Marcos Forever. How can Leni Robredo lead this country when she cannot even lead the opposition altogether? What is her qualification? Her so-called position is in doubt and her dummy Atty. Macalintal wanted to shove his worthless statement to our collective throats to give her amo a try! Gee whiz, has the world gone mad? Hold on Mr. President Duterte, the entire Filipino nation is still behind you. The whole history of this country were just all failed leadership by the elite from one to another elite and to another with no intention of changing the status quo and just keep the ordinary people divided and squabbling against each other, and that will be the whole story over and over. she wont liFT a finger other than looking Pretty lenilutong lugaw of lantarang Pangagago =dumbdowning Juan Delacruz that was fooled and cheated by smartmatic voting counting machine for the lantarang panloloko sa mga Pilipinong na brainwashed by Marcial Bonifacio aka Ninoy Aquino madbomber of Plaza miranda and Cpp/Npa/Ndf communist party of JOMA sison for thirty five years of madpnoy abnoy kulangkulang99 Creator of four million pilipino addicts that ruled for three decades of fake news manipuulation. Her mandate to rule is questionable, and proving the real outcome of the past election is being unreasonably difficult. The disadvantaged Filipinos who make up the bulk of voters have this illusion that the leaders they choose will still be faithful to them given that money is power in this particular system. So how the hell can we expect justice when the power imbalance can largely favor even the undeserving? The question of whether Lugaw Robredo was elected with the will of the Filipino people. Or , if she implanted herself, thru deceitful means in the Vice Presidency, must be resolved, before, we talk of her possible replacing , Pres. Duterte. We don’t want our will as voters, to be replaced by the will of the SMART SWITIK or HOCUS PCOS, or of the election crimes of the crook COMELEC Chief, Andres Bautista. Lugaw Robredo, has never shown excellence in academic world, or in governance. To tell us, that some sort of magic will give her the wisdom of governance is laughable. The fake VP Lugaw Robredo, has barely any years in experience of governance. She is just a wife of a crooked Mayor, in a third rate City in Bicol. One of the first things COMELEC Chairman Andres Bautista did in his attempt to cover his pale behind following the explosion of what could be the Corruption Scandal of the Decade, is to attack the character of his wife. Despite the issue clearly being about his unexplained wealth and the discrepancy it presents vis-à-vis his official personal wealth as declared in his Statement of Assets Liabilities and Net Worth (SALN), Bautista chose an ungentlemanly approach to dealing with the allegations. Can Bautista continue to be regarded as a man for others after treating his own wife in a dishonourable way? FRaudredo =She is not Prepared to be a President for her Vice President Position is still under Protest because of Comolect Andres Bautista lenilutong lugaw of Smartmatic of mark malloch brown =political adviser and speech writer of Santa Corykot lantarang Pangugurakot at Pangagago sa Pilipinas for thirty five years of voting counting manipulations, it looks life forever suffering of late corykot wishes of Let the People Suffer so that they will hate Marcos Forever. Can Bautista continue to be regarded as a man for others after treating his own wife in a dishonourable way?One of the first things COMELEC Chairman Andres Bautista did in his attempt to cover his pale behind following the explosion of what could be the Corruption Scandal of the Decade, is to attack the character of his wife. Despite the issue clearly being about his unexplained wealth and the discrepancy it presents vis-à-vis his official personal wealth as declared in his Statement of Assets Liabilities and Net Worth (SALN), Bautista chose an ungentlemanly approach to dealing with the allegations. Leni Robber-redo as Philippine Commander-In-Chief ?